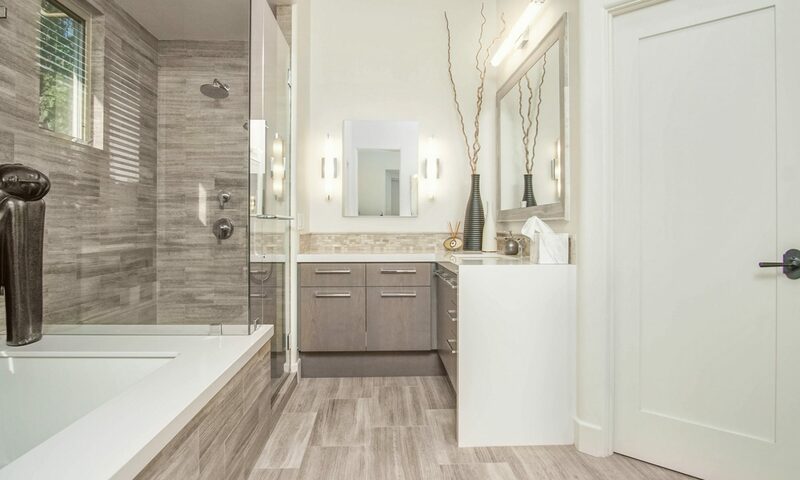 "Working with Jeff on our bathroom remodel was an absolute pleasure. He walked through everything we'd need, all the work that had to be done and the timing of it all. Throughout the process he was always proactive and kept us updated on progress since we were out of town. He really thought through all of the tile work, made some great suggestions and installed it all beautifully. Jeff is a great guy to work with. This was our first remodel so we were a bit out of our element and he made it all easy and painless. We're looking forward to working with him again." "Over the past recent years, we have always benefited highly & been sincerely pleased with our repeated decisions to have Jeff & his carefully selected team work with our home projects including major bathroom renovations, laundry room upgrades plus exterior structures for rec vehicles as well as quality fencing projects. All work is done in a fully timely manner at a fair cost & the bonus always is the attention to detail which is a high standard hallmark of Jeff's efforts toward providing outstanding results. We are very happy to have friends review each project as they are highly complimentary with their sincere comments on the fresh design ideas & quality workmanship." "We recently had our bathroom remodeled by South Fork construction, we could not have had a better experience. Jeff was very professional and helpful to us. We had no idea what we wanted in our new bathroom, Jeff and his wife Jennifer helped us pick tile and the basic theme of our bathroom. Jeff finished the project on time and on budget and we could not be happier with the quality of his work. Thanks again to Jeff and Jennifer!!" "My husband and I had hired South Fork Construction to do a larger wall and floor tile job in our kitchen, dining, downstairs bath, and sitting room. We were extremely pleased with his work and job ethics. We have had numerous compliments on his work. When we had a smaller upstairs bathroom floor tile job to do, we knew who to call. It looks beautiful and we are very pleased. We plan to use him again as soon as our new house is ready. I would highly recommend him." "Since 2008 we've had several wonderful experiences working with Jeff in a variety of home improvement projects. Jeff masterfully installed a hand-scraped teak hardwood floor throughout our home, with intricate glass and granite tile work in the kitchen and bathrooms, custom appliances, slate tile kitchen floor, and interior and exterior trims. Where we had vague ideas, Jeff brought inspiration, insight and innovation. He helped us to develop our visions in the most qualitative, resourceful, and economic ways possible. His local influence, ethics, artistic eye, and sustainable vision have given our home unique spaces that feel timeless, transcend fads, and are meant to be enjoyed for generations. Additionally, Jeff has repaired portions of our roof and façade and beautifully remodeled our master bathroom installing hand-cut granite and new fixtures while repurposing/giving new life to some of the previously installed bathroom fixtures and custom cabinetry. We wouldn’t dream of attempting a home improvement project without Jeff’s input." "Jeff Teie is extremely professional and knowledgeable. Always on time and ready to get the job done. Jeff went over and beyond the call of duty, as he takes great pride in his work. His pricing was competitive, but less than some of the other quotes we received. I would hire him again. Jeff is very organized and explains the work he is about to perform, so one knows exactly what to expect.He is also pleasant and trustworthy. I find these qualities to be rare in other companies I have hired in the past. In a nutshell..........Jeff is great!!!" "Jeff and the guys at South Fork Construction were a great help with our Kitchen Remodel. From planning and design to advising us through some unexpected extra electrical work that came up once we started tearing into stuff, they were with us every step of the way. I would highly recommend Jeff and his team." "Jeff understands his work and knows how to get a good job done. Jeff is timely and efficient and we look forward to future projects using South Fork Construction." "Jeff was patient and willing to work with us on a relatively small scope of work. We appreciated his proactive approach to getting the work done well. We will be sure to give him a call for similar work in the future."